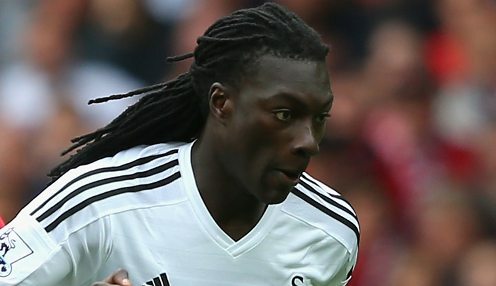 Lyon president Jean-Michel Aulas has revealed that Bafetimbi Gomis turned down the chance to move to Swansea City for £10million in the summer of 2013. The Swans eventually signed Wilfried Bony for £12million before landing Gomis for nothing when he became a free agent at the end of last season. The 29-year-old has failed to score in his first five Premier League appearances for the Swans but is 1/1 to score at any time against Stoke City on Sunday in a game Garry Monk's side are available at 1/1 to win 2-1. Bafe thought that Swansea was a second-tier club. Aulas claims a deal was agreed between the clubs for Gomis but that the striker ejected the move because he felt Swansea were a "second-tier club". He said on revealing the French side's poor financial results: "They are not what we wanted. We wanted to sell 20 million euro worth of players. We had an agreement for 12 million euro with Swansea at the beginning of last season and Bafe thought that Swansea was a second-tier club. "This summer, we responded favourably to the demands of Clement Grenier and Samuel Umtiti to leave, but that didn't happen either." Lyon are 1/1 to win the France Ligue 1 2014/15 outright this season while Swansea are 1/1 to finish in the top half of the Premier League table.